Finished the label on last year's BOM so can now start on their 2019 one that started in February. The new one is 10" finished blocks, so will be quite different than this one, some of these blocks are 24" .... I didn't use the pieced blocks on the front, as there were enough bonus blocks to make it the right size for me. Really a great BOM. It was nice to finish this one before starting the next one. This one has lots of interesting blocks. Adorable...that looks like it was a fun BOM. So much detail...you did a marvelous job. Great job! Love all the campsites. Wow! So talented. Love it and thanks for sharing. I'm impressed that you kept up with the BOM so well. It is rewarding to end up with such a darling quilt, too! Enjoy 2019! Thanks everyone! I did manage to work on my Feb blocks today.... 6 hrs with no power...2 hrs with power.... 1 hr without...... I resorted to handwork after the first blip! I love it! Please, could we have some close ups? Really cute! Great work. Looks like it was a fun BOM. That is really cute! I like the raccoon in the bottom middle. All the animals have great personalities. So cute. I love the bear fishing, the deer, and the cozy looking cabin-oh heck-I love it all! You did such a great job on it and so enjoyable to look at. Where did you get the BOM for 2018 and 2019? Those blocks are so cute. That's so cute. 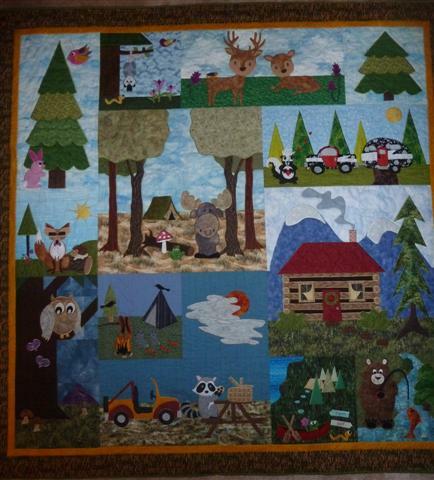 I like that there is so much to look at in the quilt. You did a fantastic job on it. I'm thinking about the 2019 BOM but I'm still on the fence. Sounds like it will be blocks that represent the different seasons of the year. Here's a link to the 2019 BOM & the first 2 blocks are still free during February. If you click on the link that osewme posted it will bring you to the blog. Along the top there are tabs for each year BOM. The pattern is only free the month it is posted and then it is for sale later. If you are interested in past years it might be better for you to contact the blogger because recently Craftsy did a purge of many of the designers, so some of the links may not go through to the actual pattern now. Such a fun looking BOM. Delightful. You have a summer's worth of images here.